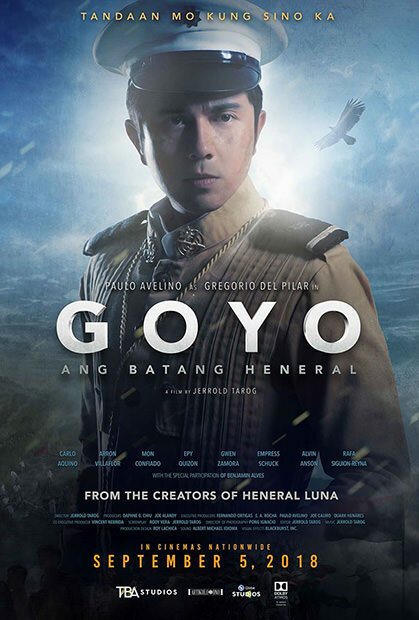 Paolo Avelino topbills this historical film, reprising his role as the young general Gregorio del Pilar he once portayed in "Heneral Luna." Avelino is joined by: Jason Abalos, Art Acuña, Benjamin Alves, Alvin Anson, Carlo Aquino, Christopher Aronson, RK Bagatsing, Perla Bautista, Nonie Buencamino, Roeder Camañag, Mon Confiado, Carlo Cruz, Jason Dewey, Miguel Faustmann, Bret Jackson, Ronnie Lazaro, Guji Lorenzana, Jojit Lorenzo, Leo Martinez, Lorenz Martinez, Karl Medina, Epy Quizon, Che Ramos, E. A. Rocha, Tomas Santos, Empress Schuck, Robert Seña, Stephanie Sol, Markki Stroem, Arron Villaflor and Gwen Zamora. "Goyo" is the second installment in the planned historical trilogy that will focus on the heroism of the young General Gregorio del Pilar, including the events transpiring soon after General Antonio Luna's brutal death. Tarog's film is expected to be released in 2018. "Goyo" is expected to be finished in October 2017, but Director Tarog said that they will not submit the same in the upcoming 2017 Metro Manila Film Festival. Scheduled for release on September 5, 2018, Goyo: Ang Batang Heneral is the second of a war trilogy set in the 1900s and is the sequel to the 2015 film Heneral Luna. It is set after the death of General Antonio Luna and will highlight the life and philosophies of General Gregorio "Goyo" del Pilar. While we wait for September 5 for 'Goyo: Ang Batang Heneral,' the sequel to the highly successful historical biopic 'Heneral Luna,' director Jerrold Tarog presents a short film that connects the two movies. 'Angelito' is a 20-minute short film now available online, and follows the story of brothers two days after the death of Antonio Luna. The short stars Tomas Santos, Alex Medina, and Art Acuna, and also features Carlo Aquino, Arron Villaflor, and Jojit Lorenzo. The film fills in the gap between Heneral Luna and Goyo, and is loosely based on historial events. Not the heroic, flag waving, valor laden inspirational movie that most audiences may expect. Instead, director Jerrold Tarog and his fine team presents a fresh, rich portrait of our country's heroes; humanizing them, uprooting the Filipino culture of idolatry and taking the revered down from their high pedestals. It's a character study of a hero held in high esteem by most, and yet deeply egoistic, flawed and fallible inside, with questionable motivations that may not be as heroic or nationalistic as they may seem. It's also a cautionary tale of Philippine history, a strong reminder that we as a people are not learning from the lessons of the past. The film entails critical reflection on ourselves as Filipinos, how we choose our heroes and what it really means to be nationalistic. Technical and production merits are all outstanding. The script in particular is excellent in how it peels down the layers of the multiple characters to expose their human mistakes and yet ultimately presenting a film that upholds true love for the country. How does this compare to the Carlo J. Caparas film? LOL. Why aren't they including this in MMFF? Beautiful production, but Goyo, as a character in this film, lacked agency. He walks into scenes and has absolutely no contribution to anything, other than to serve as the reference for other characters to make their decisions and their plot-changing actions. The only decision Goyo ever made that affected the story? The idea for the battle at Tirad Pass. It's the one and only decision his character makes throughout the entire film. And no, he didn't decide to marry Remedios in that masterful and beautifully-done party dance scene (one of the best sequences I've ever seen in a film, by the way). Marrying her was a motivation, one that he did not show any progress towards realizing as he casually stumbles through following Aguinaldo towards the north. Again, beautiful production. The main character, was just terribly written. José Alejandrino was the true main character because that character had the most agency of anyone in the film. But I have high hopes for the next one in the trilogy (will it be about Manuel Quezon?). So, for it's one fault I would consider Goyo the Empire Strikes Back of the three because in many ways, it's still a well-done film. ^ They shot the Battle of Tirad Pass at Mt. Balagbag in Rizal. I see.. thanks for that info!! 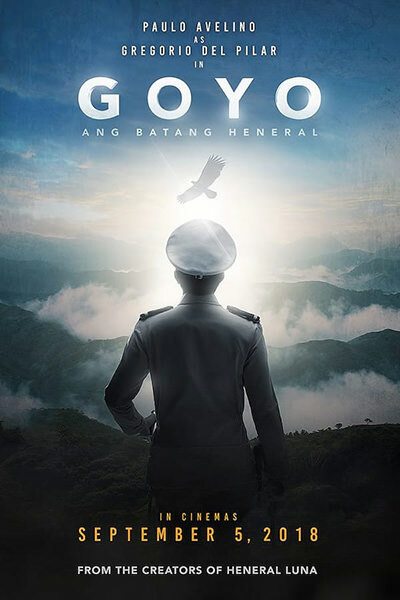 Goyo: Ang Batang Heneral launches on Netflix this January 26, 2019. It's there now. So the date must've been for the US EST timezone. Finally saw this in Netflix, I found Heneral Luna far more superior than this one. There's a lot of face palm moments here for some characters situations, which I think what really happened during that time. I'm not complaining tho, this is more human compared to that other super-hero film by Carlo J. Caparas. Jerrold Tarog be like "Here's our local hero Gregorio del Pilar a.k.a GOYO........ Impressed?" I hope Jerrold Tarog can complete his "Rise and fall of Emilio Aguinaldo" Trilogy.